On the most fundamental of levels we were born to create. Every moment of our lives is being shaped by our intention, thoughts, actions and behaviors. Everyone is a creator, BUT not everyone is an artist. I like to think of artists as Extra Intentional Creators, those that consciously take nothing and turn it into something. I'm not a morbid person, but I think about death pretty regularly - my death, the death of my parents, the death of my friends. I don't brood or obsess on it, but rather keep this cold, hard fact in the back of my mind when I start to believe that life is long, that time is an everlasting resource, that it's okay to take people for granted as long as you appreciate them. Keeping death in mind reminds me of these false beliefs and helps me to live better. 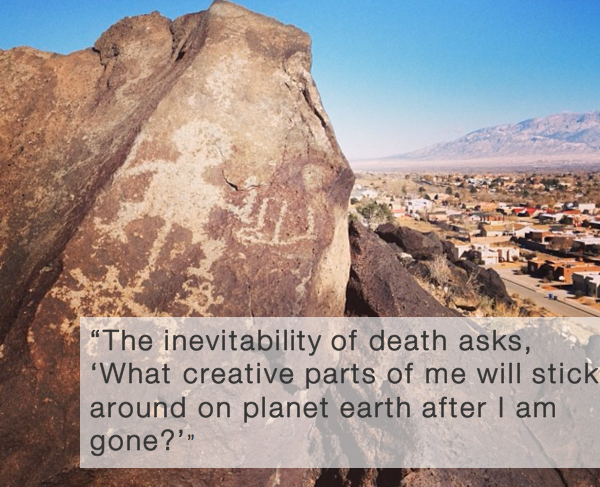 The inevitability of death asks, "What creative parts of me will stick around on planet earth after I am gone?" To date, there are paintings and mixed media works, poems in journals (and one in a college magazine), finished and unfinished screenplays, short films, a few courses, artist manifestos and a couple of books-in-process. It's not a bad legacy as far as legacies go, and sometimes, in the Quest for More and Better, I forget all I've created in this life. Meditating on the idea of a creative legacy has lead me to narrow down what I believe are the two most important aspects of producing a significant body of work: focus and voice. If we want to leave a lasting legacy, one that will continue to speak after we're gone, we need to tap into these two aspects of our creative process. FOCUS As a multi-passionate person, I know the ups and downs of having an interest in various mediums, genres, and processes. I've spent my life working multiple projects at a time across a span of media. Though this juggling can be important to early stages of creation, I've concluded that to produce a complete body of work that fully explores an idea, we need to focus. Not just on removing the day-to-day distractions that prevent us from fully expressing ourselves, but also on creating one thing at a time. Paint when you are painting, write when you are writing, and so forth. To constantly toggle back and forth between things is to do a disservice to your work. It stretches your focus, waters down your intent, and interrupts the flow of your process. With focused spurts of time, we can truly get deep and bring forth a Complete Expression. VOICE Honing one's voice takes time. For every idea, there is a Thing That Wants to Be Expressed. It's our job to determine the medium of this expression, as well as how it will be "said." Honing your voice is not about one project; it's about multiple projects, months of projects, years of projects. Voice is about the unique fingerprint you bring to the expression. Since every one of us is unique in our history, experiences, and point of view, our voices are unique too. It takes an incredibly diligent creator to ignore the voice of others and reveal their own voice, but this is what's required when building a legacy. So, I ask you, what will your creative legacy be? How will you bring focus to your days, weeks, months and years in order to fulfill that legacy? What steps have you taken to uncover your own unique voice that will resonate through time?